Boxing is one of the world's oldest combat sports. It is usually held in a ring and two boxers (people who fight in boxing fights) wear special gloves and try to hit one another. There are a few different ways to win in boxing. One is by a way of a knockout, which is when a fighter is knocked to the ground and cannot get back up within ten seconds. Another way is by a technical knockout, which is when the fighter can not continue fighting or the referee stops the fight. 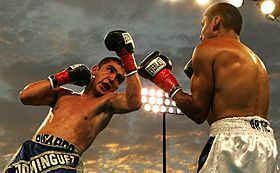 Another possibility is winning on points, which a boxer gets by outboxing his or her opponent by hitting the opponent more often, harder, and more accurately. There are also draws in boxing. What in other sports are called "tie" in boxing it's called "draw". A referee can announce a technical draw due to an accidental cut or an accidental wound like a headbutt. Generally, it is considered a "no contest" (NC). However, from the second round, or four in some fights, if the score cards for both fighters are equal, the fight could be called a draw. Boxing is very popular around the world. It is a way to defeat your enemy by physical force. Since boxing involves forceful, repetitive punching, precautions must be taken to prevent damage to bones in the hand. Most trainers do not allow boxers to train and spar without wrist wraps and boxing gloves. Hand wraps are used to secure the bones in the hand, and the gloves are used to protect the hands from blunt injury, allowing boxers to throw punches with more force than if they did not utilise them. Gloves have been required in competition since the late nineteenth century, though modern boxing gloves are much heavier than those worn by early twentieth-century fighters. Prior to a bout, both boxers agree upon the weight of gloves to be used in the bout, with the understanding that lighter gloves allow heavy punchers to inflict more damage. The brand of gloves can also affect the impact of punches, so this too is usually stipulated before a bout. Both sides are allowed to inspect the wraps and gloves of the opponent to help ensure both are within agreed upon specifications and no tampering has taken place. In a fully upright stance, the boxer stands with the legs shoulder-width apart and the rear foot a half-step in front of the lead man. Right-handed or orthodox boxers lead with the left foot and fist (for most penetration power). Both feet are parallel, and the right heel is off the ground. The lead (left) fist is held vertically about six inches in front of the face at eye level. The rear (right) fist is held beside the chin and the elbow tucked against the ribcage to protect the body. The chin is tucked into the chest to avoid punches to the jaw which commonly cause knock-outs and is often kept slightly off-center. Wrists are slightly bent to avoid damage when punching and the elbows are kept tucked in to protect the ribcage. Some boxers fight from a crouch, leaning forward and keeping their feet closer together. The stance described is considered the "textbook" stance and fighters are encouraged to change it around once it's been mastered as a base. Case in point, many fast fighters have their hands down and have almost exaggerated footwork, while brawlers or bully fighters tend to slowly stalk their opponents. Jab – A quick, straight punch thrown with the lead hand from the guard position. The jab is accompanied by a small, clockwise rotation of the torso and hips, while the fist rotates 90 degrees, becoming horizontal upon impact. As the punch reaches full extension, the lead shoulder can be brought up to guard the chin. The rear hand remains next to the face to guard the jaw. After making contact with the target, the lead hand is retracted quickly to resume a guard position in front of the face. Hook – A semi-circular punch thrown with the lead hand to the side of the opponent's head. From the guard position, the elbow is drawn back with a horizontal fist (knuckles pointing forward) and the elbow bent. The rear hand is tucked firmly against the jaw to protect the chin. The torso and hips are rotated clockwise, propelling the fist through a tight, clockwise arc across the front of the body and connecting with the target. It should be noted both the hook and uppercut may be thrown with both hands, resulting in differing footwork and positioning from that described above if thrown by the other hand. Generally the analogous opposite is true of the footwork and torso movement. Boxing Facts for Kids. Kiddle Encyclopedia.